The IL-17 family of cytokines contains six members, including IL-17/IL-17A, IL-17B, IL-17C, IL-17D, IL-17E/IL-25, and IL-17F, which are produced by a number of different cell types and primarily promote pro-inflammatory immune responses. Cytokines belonging to the IL-17 family are secreted as dimers and bind to members of the IL-17 receptor family. There are 5 members in its receptor family, involving IL-17 R/IL-17RA, IL-17B R/IL-17RB, IL-17RC, IL-17RD/SEF, and IL-17RE. All of these receptor subunits are type I transmembrane proteins that contain two fibronectin type III-like domains in their extracellular regions and a cytoplasmic SEF/IL-17 R/TIR (SEFIR) domain. Unlike the other IL-17 family receptors, IL-17RA also contains a cytoplasmic Toll/IL-1 R-like loop (TILL), and a C/EBP beta activation domain (CBAD). The IL-17 family receptors oligomerize to form functional receptor complexes. Although the stoichiometry of these complexes is not well understood, the receptor for IL-17A, IL-17F, and IL-17A/F is thought to be a heterotrimeric complex consisting of two IL-17RA subunits and one IL-17RC subunit. The IL-17RA receptor subunit also interacts with IL-17RE and IL-17B R/IL-17RB to form functional receptor complexes for IL-17C and IL-17E/IL-25, respectively. IL-17 plays critical roles in host immunology. IL-17A is the hallmark in this family that it protects the host against extracellular pathogens, but also promotes inflammatory pathology in autoimmune disease, similar to IL-17C. While IL-17F involves in the mucosal host defense, IL-17E amplifies the Th2 immune response. 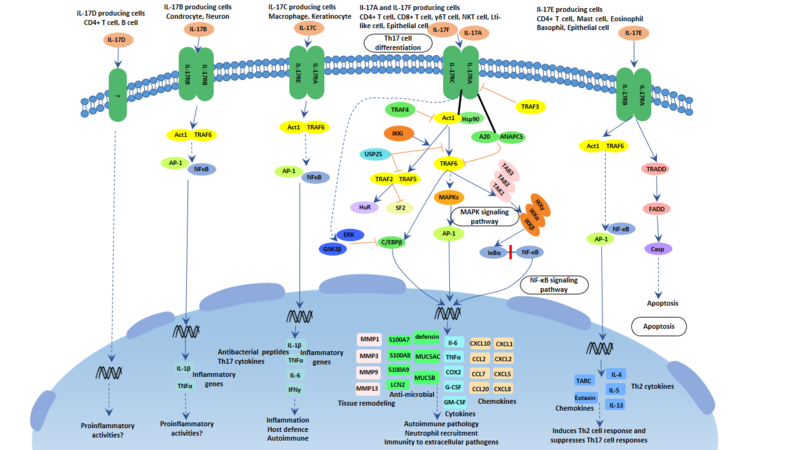 The IL-17 family activates antibacterial cytokines and chemokines in MAPK, NF-κB and C/EBPs pathway. Act1 is considered as the master mediator in this pathway.